This wild sport is popular in horse-happy Central Asia, where riding traditions go back thousands of years. It involves large numbers of riders battling for possession of a goat carcass or sheepskin. The sturdy, agile ponies of the region are well suited to this rough and tumble sport. 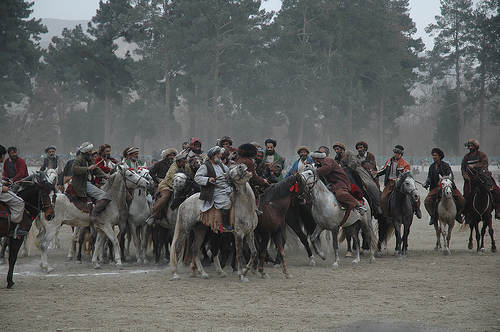 Flickr has a number of good images tagged buzkashi. The photo here is from danielkerr.tiddlyspot.com on flickr. Update: here's another photo you should see: an Afghan horse waiting to play Buzkashi. Look at the ornate saddle blanket! And here is a website (this article in German, but some others on the site in English) with some nice black and white images and description of a Buzkashi match in Uzbekistan. The game alternates between hell-bent gallops as one rider gains control of the carcass and runs off with it, and brutal scrums where the carcass has fallen to the ground or is in a tug of war between several players, and everyone pushes and shoves to try to reach it. Here is a good video clip of part of game. You can see how vast the playing field is!